Mattis did not freeze Trump’s transgender troops ban. 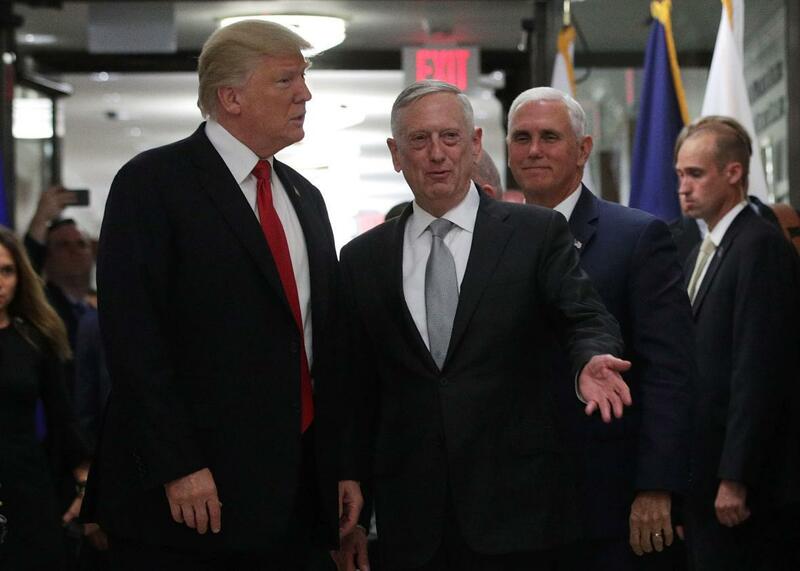 President Donald Trump listens to Secretary of Defense Jim Mattis as Vice President Mike Pence looks on after a meeting at the Pentagon. On Tuesday evening, USA Today published a surprising report alleging that Secretary of Defense James Mattis had frozen President Donald Trump’s ban on transgender troops. Mattis, the report explained, had convened a panel of experts to study transgender service and make recommendations next year. His “move,” the article concluded, “buys time for the Pentagon” to determine the fate of trans troops who are currently serving. This framing is an extreme mischaracterization of the facts. Mattis did not “freeze” the trans ban, and he is not “buy[ing] time” in some potentially insubordinate effort to buck Trump. In reality, the secretary is doing exactly what Trump directed him to do in a recent memo. Trump notoriously tweeted his ban on trans troops in July, but the Pentagon—which had reportedly not been consulted—declined to enact the new policy without further information. So on Friday, Trump issued that information in a memo directing the implementation of his ban. The memo ordered the secretary of defense, in consultation with the secretary of homeland security, to “determine how to address transgender individuals currently serving in the United States military.” Their study must focus on “military effectiveness and lethality, budgetary constraints, and applicable law.” By Feb. 21, 2018, the secretaries must submit a plan explaining how best to implement the ban. And on March 23, 2018, the full ban will take effect. Until then, “no action may be taken” against openly trans troops who are now serving. In his Tuesday announcement, Mattis declared that he will do precisely what the memo requires of him. He is not suspending the ban or disobeying Trump, but simply following orders. Moreover, as Nathaniel Frank explained in Slate, the memo does not give Mattis real discretion in executing the ban. He can, theoretically, provide a recommendation that Trump scrap it. But barring a reversal by the president, Mattis lacks any real ability to protect trans troops. The strategy laid out in Friday’s memo is designed to lend legitimacy to an arbitrary and capricious policy that is motivated solely by politics. In fact, the Pentagon already commissioned a study which concluded that open transgender service will have no negative effects on the military while costing very little. Mattis’ new “study,” by contrast, will almost certainly provide some pseudofactual cover for the trans ban. These reports of a “freeze” on the ban—which many outlets, including Slate, have picked up and framed as USA Today did—serve the administration’s narrative in two ways: They legitimize a “study” that is designed to reach a foregone conclusion, and they falsely portray the ban as more lenient or unsettled than it really is. Absent court intervention, the trans ban will take effect next year. And unless Trump changes his mind, there is virtually nothing Mattis can do to stop it.